Great place to stay clean, tidy. Ideal location, pleasant (@ efficient) staff. good value for money. Many thanks for stayed in Flagstaff City Inn. We will keep to improve our services and hotel facilities. Hope all guest enjoy to stay in our hotel. Many thanks for stayed in our hotel. We will keep to improve our services and hotel facilities, hope all guests enjoy to stay in Flagstaff City Inn. I found this hotel suited my needs perfectly. The room I stayed in (210) was very quiet, you forget how noisy Melbourne is until you walk out the front door of the reception. It has all the basics, tea, coffee, hair dryer, ironing board etc. The only down side to some people would be the distance from public transport, being a couple of blocks away from trams means a 5-10 minute walk every morning but it's a safe area so it's not so bad. Many thanks for you stayed in our hotel. Many thanks for stayed in our hotel. We will keep to improve our services and facilities. Many thanks for stay in our hotel. We will improve our service continuously. Hope all guests happy to stay in Flagstaff City. This was our second time staying at Flagstaff, having enjoyed the previous stay. It is quiet and the staff are always pleasant and helpful. Have only ever stayed with two people - 'Standard Double + Single' rooms may not feel large enough with 3 people. Comfortable beds and nice bathrooms. Many thanks for stay in our hotel. We will improve our service hope guest enjoy accommodate in Flagstaff City. Many thanks for stay in our hotel. We will improve our service and facilities. Hope all guest enjoy to stay in Flagstaff City Inn. Thanks for stay in our hotel. Pleasant staff and clean room, it was just a little smaller for three people than we expected. Many thanks for stay in our hotel. We will improve our services hope all guests enjoy to stay at Flagstaff City Inn. Was surprised how good this motel is because some ratings are bad. Was nice and quiet and a good spot. I have no complaints. Many thanks for stay in our hotel. We will keep to improve our services and facilities. Hope all guests enjoy to stay in our hotel. Many thanks for stay in our hotel. We will improve our facilities and services, also keep to renovate room and building. Hope all guest enjoy to stay in our hotel. Many thanks for stay in our hotel. Hope to see you again. Many thanks for stay in our hotel. Many thanks for you stay in our hotel. We will keep to improve our services. Hope to see you soon. Many thanks for you stay in our hotel. We will improve our facilities and service. Thanks for stay in our hotel. We will keep to improve our facilities Hope to see you again. close to victoria market & beautiful flagstaff garden. easy access to the city. free wifi. Many thanks for your family stayed in our hotel. We will improve our services and facilities. Hope to see you next time. We can not complain about the Flagstaff City Inn. You get what you pay for and we are very happy with it. Many thanks for stay in our hotel. We will keep to improve our services and facilities. Hope all guests satisfy stay with us. the hotel was wonderful and my sister and I really enjoyed staying there. it was a perfect hotel for us and the service we got was great. Many thanks for you stayed in our hotel. We will improve our services and hotel facilities. Hope the tram 75 will extend to Dudley street. Many thanks for stayed in our hotel. We will improve our services and facilities. Hope you enjoy to stay in our hotel every time. Easy to get to, clean and comfortable room, great price. Breakfast was lovely, staff were friendly, couldn't of asked for anything more. Many thanks for stayed in our hotel. We will keep to improve our services and facilities. Also we will renovate the building. Hope all guests enjoy to stay in our hotel. Many thanks for you stay in our hotel. We will keep to improve our hotel facilities and services. Hope our guest satisfy to stay with us. Need a comfy bed for the night and that's what I got ! Many thanks for you stay in our hotel. We will improve our services and room facilities. Hope all guests satisfy with our service. Excellent service, great location. Thanks for a great stay! Many thanks for you stay in our hotel. We will keep to improve our services and facilities. Hopte all guests satisfy to stay in our hotel. Really good place to stay. Thank you! Many thanks for stay in our hotel. We will keep to improve our services and facilities. Hope all guests satisfy to stay with us. Many thanks for you stay in our hotel. We will improve our services and facilities. hope all guests satisfy to stay with us. Good value for money and close proximity to where I neded to be. Many thanks for your stay in our hotel. We will keep to improve our facilities and services, hope all guests enjoy to stay in our hotel. Very comfortable and clean accommodation. The only fault I could find on cleanliness was that there was quite a bit of dirt/dust on the skirting beside and behind the toilet but that is all. Many thanks for your stay in our hotel. We will improve our housekeep job. hope all guest enjoy to saty in our hotel. Many thanks for stay in our hotel. We will improve our rooms facilities and improve our service. Hope all guests enjoy to stay in our hotel. Many thanks for staying in our hotel. We will keep to improve our services and hotel facilities. hope all guests enjoy to stay with us. Many thanks for staying in our hotel. We will keep to improve our services. Hope all guest are enjoying to stay in our hotel. Although there is only stairs to get to your room. 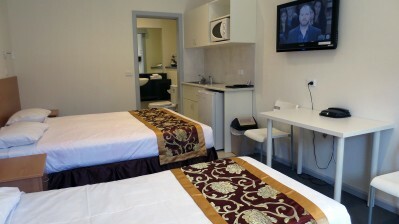 The rooms are clean and comfortable and most of them are in a location where you can not hear road traffic. Which is fantastic for travellers that are bot used to noise. A very pleasant stay and quality for money. Will certainly stay again. Many thanks for staying in our hotel. Unfortunately we are a motel style building there is not an elevator. We tried to install a left but didn't be approved by City Council they said we are only 2 levels building. Sorry it caused inconvenience. We will improve our rooms facilities and services hope guests enjoy to stay with us. Our stay was good just what we were looking for. It was a short distance from the train station and a short distance from the even we were going to. Many thanks for staying in our hotel. We will keep improve our services and facilities to offer guest a comfortable place. Many thanks for you staying in our hotel. Unfortunately we are a motel style building there is not an elevator for guests. We will improve our services and rooms facilities hope guests enjoy to stay in our hotel. Many thanks for staying in our hotel. We will improve our service and facilities hope all guests are enjoying stay in our hotel. It was a lovely room, and a great bathroom. We were going to the football so the location was brilliant! Staff always acknowledged us when ever we saw them! Will definitely stay again. Many thanks for staying in our hotel. We will keep to improve our service and hotel facilities. Hope our guest enjoy to staying our hotel. On your adress letterhead it says Melbourne CBD and no POSTCODE so the Navigation finder sent us up Dudley St into the wrong block for 45??? Our stay went well but a few things need repairs eg beams on pergola in walkway and our heater. Otherwise the position to Docklands and Cavalia was excellent. Very comfortable and enjoyable. Staff are beautiful people. Very helpful and accommodating. Very spacious rooms, very clean for an older style motel, my only issue was ample parking. Many thanks for staying in our hotel. We will keep to improve our facilities, renovate our rooms and improve our services. hope all guests enjoy staying in our hotel. My experience at Flagstaff Inn Melbourne was fantastic. The staff were very friendly and helpful. The 24hr access was great as well as many nights we would return after midnight. The service was fantastic - Morris helped me bring some of my luggage up to the room. Many thanks for staying in our hotel. We will improve our parking facilities and our services.